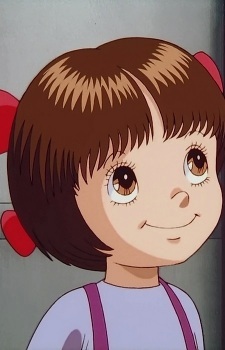 Pinoko is Black Jack's sidekick, a little girl constructed by him who is actually a Teratogenous Cystoma, a sort of tumor also known as a teratoma. As seen in Teratogenous Cystoma, she was a rare type of Siamese twin, living in one of Black Jack's patients' bodies for eighteen years until Black Jack extracted her and gave her a real body, a plastic exo-skeleton. After being rejected by her twin sister, she started to live with him in his house. She always helps the doctor by doing house-chores and even acting as an assistant to some of his operations. She often acts as comic relief in Black Jack, physically and in many ways mentally appearing to be around the age of five years, but claiming to be a girl of eighteen and engaged to him, despite that he only treats her as a daughter.